Apple has brought another iOS feature 'back to the Mac' in the form of push notification services for the beta version of FaceTime for Mac, which can notify you of an incoming video call even when the application is not running. When the long-awaited release of Apple's FaceTime for Mac came in the form of a beta Wednesday, users were pleasantly surprised to find that they could receive calls without leaving FaceTime open. 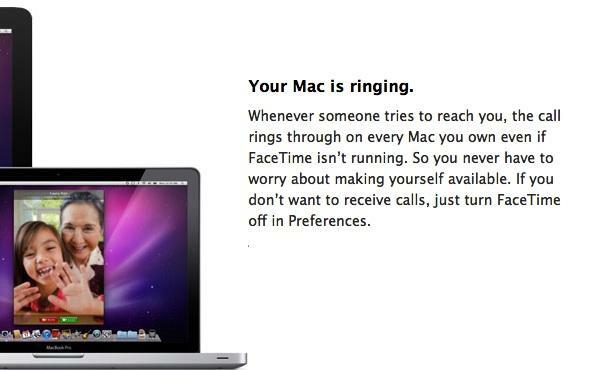 If you don't want to receive calls, just turn FaceTime off in Preferences." Shortly after the application became available, German blogger Florian Schimanke noticed (Google Translation) a related background process "apsd-ft" and surmised that the process stood for "Apple Push Service Daemon - FaceTime." Also, users attempting to uninstall FaceTime for Mac sought help on the Apple Support forums when Mac OS X refused to allow the deletion of the application because it was "in use." Signing out of FaceTime from the FaceTime menu or disabling FaceTime in the application's preferences pane halts the "apsd-ft" process and allows the FaceTime application package to be deleted. 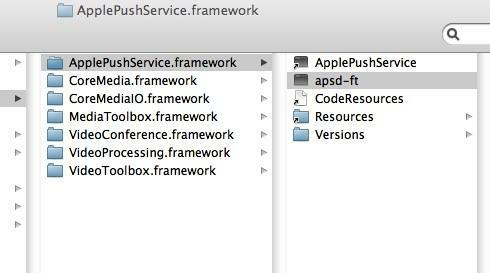 A look inside the contents of the FaceTime.app package reveals an ApplePushService.framework folder with the apsd-ft process and relevant property list files. Early users of the FaceTime for Mac beta reported a security issue with the program. The application initially allowed users to change their iTunes password without inputting the existing password, but the feature was quickly disabled. This isn't the first time that Apple has brought push services to the Mac, however. In 2008, Apple replaced its .Mac service with MobileMe push internet service, allowing users to push email, calendars, contacts and more to the iPhone, iPod touch, Macs and PCs. In preparation for push services on the iPhone and Mac OS X Snow Leopard Server, Apple built its own Push Notification Server from the ground up using open standards. With the release of iOS 3.0 in 2009, Apple made good on its 2008 promise to bring third-party push notification services to the iPhone and iPod touch. FaceTime for Mac might be an early indicator that Apple will expand the push notification options on Mac OS X next year as it brings numerous iOS features to the Mac with Mac OS X 10.7 Lion.